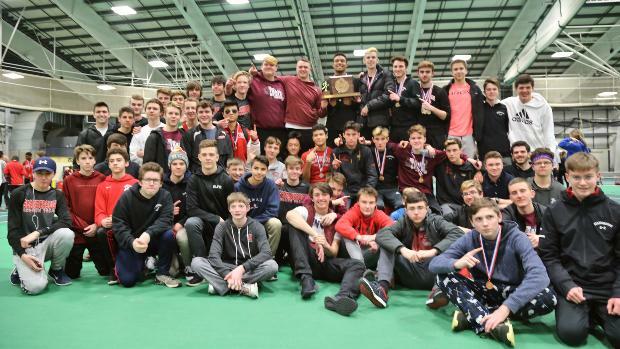 The Scarborough boys once again raised the Class A state title winning for the eighth time in nine years. This time the Red Storm tallied 104 points scoring in every event to out distance runner-up Thornton Academy by 34 points. Thornton Academy senior Travis Snyder broke the state meet record in the pole vault with a 16-7 clearance. Snyder had the best vaulting day of his career clearing 15-0, 15-9, 16-3 1/4, and 16-7 on first attempts. The 16-7 effort also broke the state all-time record of 16-6 1/2 set back in 2008 by David Slovenski of Brunswick. Snyder's teammate Jason Montano also got in on the record breaking as the senior heaved the 12lb shot out to 62-0.25 to surpass the two year old mark of 61-2 set by Austin Lufkin of Brewer. He had two other throws over the old record as well. Westbrook senior Cameron Holloway pulled the upset in the 55m hurdles as he lowered his personal best from 8.26 to 7.92 in the final. Freshman Jayden Flaker finished third to break the state class record of 8.17 held by his brother. Falmouth distance standout John Auer captured his first individual state title as he held of Alec Troxell of Deering in a furious last lap sprint to stop the clock at 4:26.86 for a new state leading mark. Will Shaughnessy of Brunswick made a move from 1000 meters out to run away with the 2 mile state title as he ran a new personal best of 9:43.70. Brunswick held off Scarborough as the Dragons ran 1:35.03 to win the 4x200 to end the meet. Bonny Eagle's Zach Allocca took the win in the triple jump with a mark of 42-4 1/2.